Linking Verbs | What are Linking Verbs? 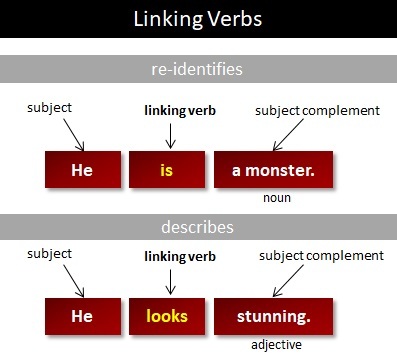 A linking verb is used to re-identify or describe its subject. A linking verb connects the subject of a sentence to the predicate without expressing an action. Here is a short video explaining what we mean by linking verbs. His father was the headmaster. This project is a disaster. The inspector will feel the fabric. The fabric will feel soft. The word, phrase, or clause that follows a linking verb to re-identify or describe the subject is called the subject complement. Therefore, the "to be" part of a passive construction (here, was painted) and a verb tense (here, is frustrating) can be considered a linking verb. "It is I" or "It is Me"? Technically speaking, we should mark these as incorrect, but we haven't. The overwhelming majority of people will use these in place of the "correct" versions. It is they! They have arrived. "It was her." becomes "She was the one."